Iran’s Foreign Minister Mohammad Javad Zarif says Tehran strongly supports the ongoing peace process in Afghanistan as it believes there is no way other than national dialogue for restoring peace to the war-torn state. The Iranian top diplomat made the remarks in a Monday meeting with Chairman of the Afghan High Peace Council (HPC) Mohammad Karim Khalili in Tehran. During the talks, Zarif referred to the significance of peace and stability as well as strengthening of national unity and sympathy in Afghanistan and said there is no way other than national dialogue and understanding for restoring peace and stability to the country. The peace process only belongs to the Afghan people, he added. 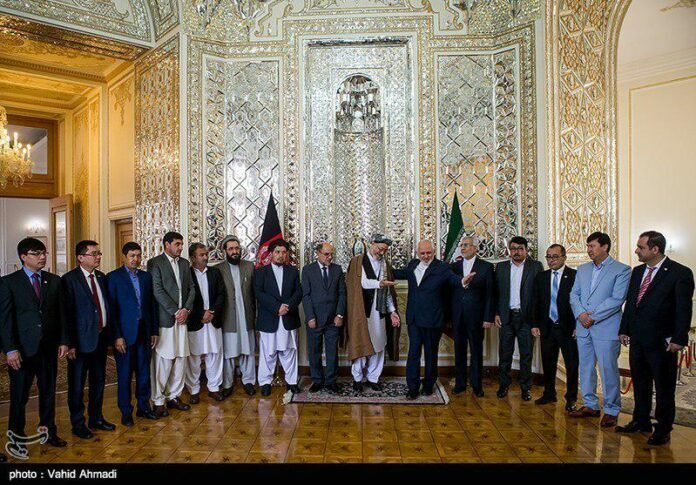 He also said Tehran supports efforts by the Afghan High Peace Council to achieve national unity and cohesion and accelerate peace process in Afghanistan. The Iranian foreign minister cited terrorism and particularly ISIS as the most significant dangers threatening Afghanistan, and said Iran is prepared to offer help to and facilitate peace process in the neighbouring country. For his part, Khalili elaborated on the efforts made by the council to strengthen national unity and foster trust among Afghans. “We thank the Islamic Republic of Iran for its attempts and support for accelerating the peace process in Afghanistan and expect the country not to cut its support,” he added.